WE ARE HIRING!! 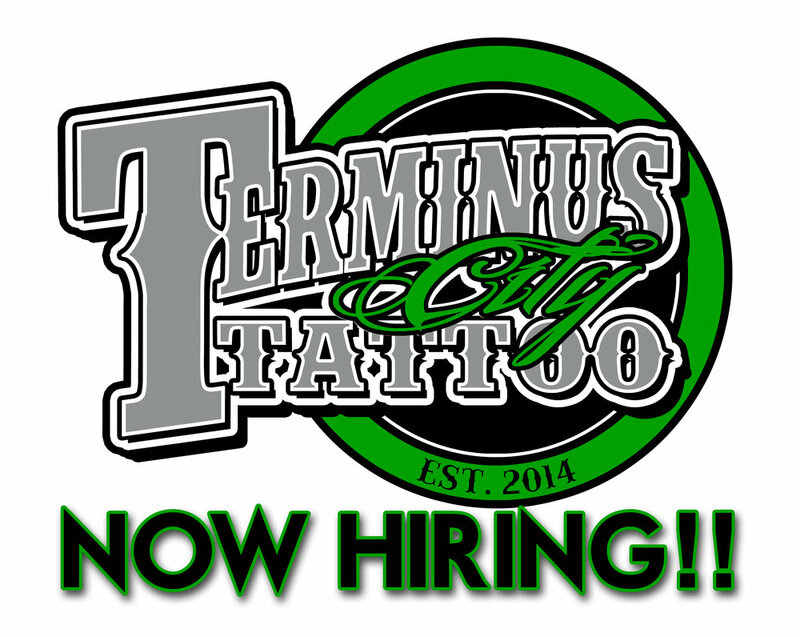 Terminus City Tattoo is now looking for a full time professional tattoo artist. We are looking for an artist who has dedicated his or her life to the craft of tattooing. We are a tight family here and we are searching for our next addition. Must have at least 2-3 years verifiable professional experience and an amazing portfolio to back it up. Even if you are a young artist and you are looking to cultivate your portfolio with the freedom to artistically do what you want to do and push your work in a direction that is 100% you, then TCT is the place for you. Talent and drive will be apparent . The ideal artist would be not only talented, but an important part of working here is you must be friendly and know how to deal with clients and co-workers in a polite and professional manner. We have an environment where we love to create art constantly and lean on and learn from each other to learn and continuously grow as creatives. If this is the kind of place that you would like to work and you meet the criteria that we are searching then please reach out. All artists are required to complete an annual Bloodborne Pathogen and First Aid Certification, as well as be licensed by Gwinnett County before starting. In order to ensure that you will be a good fit, we may request you come do a temporary guest spot. We are not looking for any apprentices right now. PLEASE! PROFESSIONALS ONLY! NO SCRATCHERS! 12 Photos that prove cheap tattoos aren't good, and good tattoos aren't cheap! When it comes to tattoos, you really do get what you pay for. Do the research and choose wisely when picking the shop to give you the tattoo that will last forever. Today is small business Saturday! Today is small business Saturday! So come by today to support your local tattoo shop and get something that will last a lifetime. We are open for walk-ins and piercings all day until 9. $50 Dollar Halloween Tattoos! WHAT!? Thats insane! OCTOBER 25th will be our Grand Opening/ Halloween Jam! We will be doing $50 Halloween tattoos until 7pm, then the party will kick off at 8pm. This will be a private party for existing customers and new ones, so feel free to bring a friend. After we close up tattooing for the night and the party begins we will have free drinks for those of age. We also will be hosting a best costume contest with free tattoos and piercings as giveaways. Please make plans to join us for our first annual Halloween Jam! When is the best time of the year to get a tattoo? Yesterday was the first day of fall and there is already that cool, crisp chill in the air. While some may mourn the end of the summer and all of the fun outdoor activities that come along with the season, others welcome a break from the heat for awhile. I myself am one of the latter. Not only is a break from the heat nice, but it is by far the best time of the year to get a tattoo. The majority of people start thinking about that new piece as soon as the weather warms and they start pulling out the shorts and tank tops in the spring. It is by no means a bad time of the year to get tattooed as long as you follow the rules for healing your tattoo. This means avoiding direct sunlight expose, and avoiding submerging the new tattoo under water for two-three weeks. As simple as that may seem, doing these few simple steps is much easier in the cooler months when you don't have to worry about missing that trip to the lake, or the beach. Even worse deciding to go anyway and ruining your investment. We can always tell when someone comes in for a touchup and it is apparent that they went swimming with their fresh tattoo. Also, while healing your tattoo it will go through a dry, itchy and sometimes even a scabby phase, which is always easier to hide under long sleeves and pants during the fall and winter seasons. Summer and spring are much busier for walk in traffic at most tattoo shops. This can mean longer wait times and more difficulty getting an appointment as well. Personally, I prefer doing more freehand work in the cooler months. It gives the artist a chance to take the time and sit down and design a piece directly on your skin and tattoo it, than when there is the crazy summer rush. In the warmer months, I tend to schedule larger pieces out farther in order to have the time to sit and design a tattoo when I am away from the shop. If you are thinking about a new piercing, now is the best time of the year for that as well. Most piercings actually take longer to heal than tattoos. While saltwater is okay for your piercing, chlorinated water is not. Getting your piercing or tattoo now will ensure that by the time the warmer weather rolls around you can enjoy the season without worry. If you have any questions or would like to setup a tattoo consultation for the upcoming cooler months, feel free to contact us here. Specials to say Thank You! After months of planning, build out, and gallons of blood, sweat, and almost tears, Terminus City Tattoo is NOW OPEN. We are super excited about what the future holds for this space we have created. Please feel free to come in and check us out!